They came from the same person? The plot thickens? Was Tomas not freaked out by all that blood? And not to mention crazy dragon! Oh good. I had thought my poor attempt at jokery had bombed. 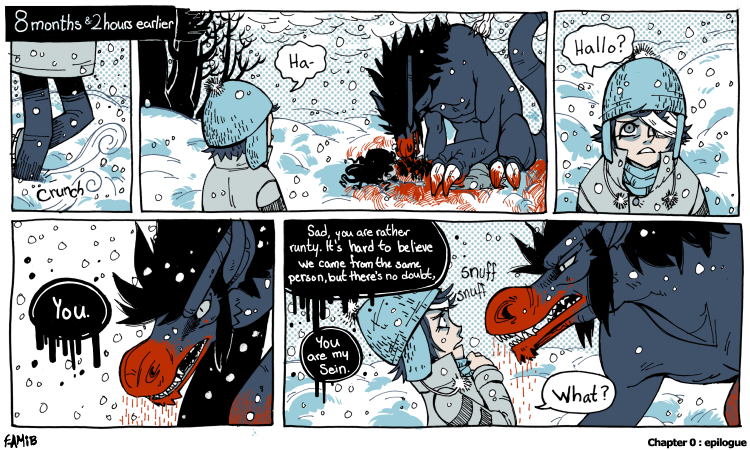 Just to clarify, from a couple pages back Tomas doesn't actually remember much from when he first met Wollen. Though that could largely be by choice. I need more time to plan out the next chapter, so it won't start updating till Monday the 15th. BUT! The 12th is FAMIB's 9th anniversary and I have to do something. So, I'll be posting new art every weekday next week in lieu of comic updates.